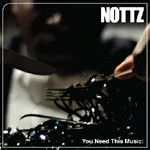 On You Need This Music, Nottz pulls no punches, charging out of the gate over a cavalcade of snares hammered out by Travis Barker, and doesn't bat an eye before jumping into the next number. He handles the entire production workload, extracting the emotive instrumental elements from vinyl clips with an ASR-10 sampler and adding his own lyrics. So goes the 14 track marathon, the pace kept by energetic verses by Black Milk, Little Brother, Asher Roth and Joel Ortiz and tempered by soulful hooks from Dwele, Mayer Hawthorne, Bilal and Colin Munroe. You Need This Music is unlike most producer-centric albums in that it isn't merely a collection of songs, but a cohesive album of essential Hip Hop gems.